Jamie here to share the latest books that have found good homes here on my shelves! Very good past week or so so I'm excited to share and hear what you got!! 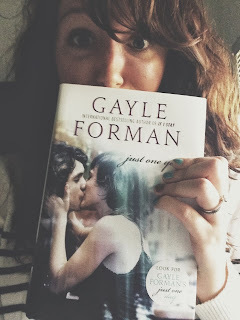 First and foremost, Gayle Forman came to my area on my birthday!! 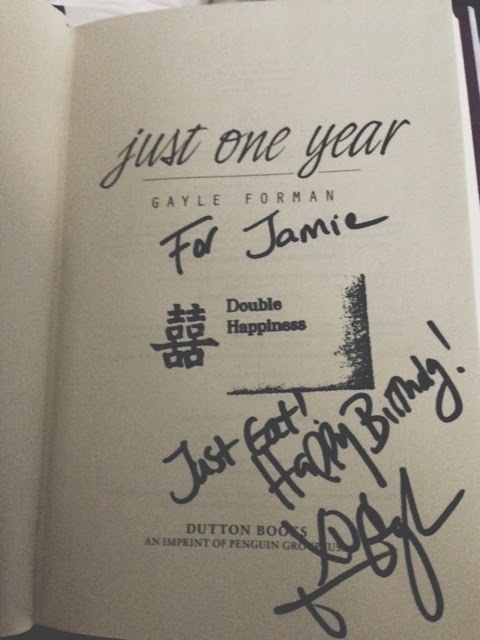 You'll have to check out my blog to see what happened in my awesome Gayle Forman-filled celebration but naturally I bought a copy of Just One Year which I LOVED. 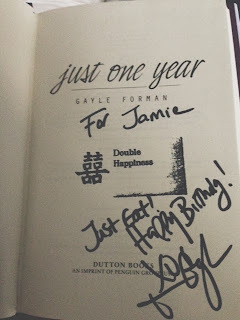 Seriously, I love Gayle Forman, my local indie and my book club friends for everything they did to make my birthday special! The lovely Jen from Pop Goes The Reader gifted me with two books she loves and I'm SUPER excited to read them. If you don't know Jen, you should probably mosey on over to her blog because she is an awesome blogger who is among my favorites! * The Rosie Project by Graeme Simsion -- I've been curious about this one for a while and I remember Jen made me excited about it after she read it so I'm SO excited to read this soon! * Vision in White by Nora Roberts -- super excited about this one as I've been getting more into the romance genre lately and the cover is stunning! My lovely friend Mitali sent me these for my birthday and I'm SO excited. Firstly, MUG CAKES. YOU CAN MAKE AMAZING DESSERTS IN YOUR MICROWAVE. You need this book. I want to make 99% of these!! And secondly, I've always wanted to read Janet Evanovich so I'm excited to check this one out! Have any of you guys read her books?? We Were Liars by E. Lockhart: EEEE!!! BEYOND EXCITED. Seriously. I loved Frankie Landau Banks and have the Ruby Oliver series on my shelves but this book seems completely different from what she typically writes and I'm excited because I LOVE psychological thrillers. Make sure this is on your TBR for 2014!! Being Sloane Jacobs by Lauren Morrill: This one sounds really cute and I love when I read a summary that features an MCs I've never seen anywhere -- a hockey player and a figure skater! So looking forward to this! Premidiated by Josin L. McQuein: I've been wanting to read this one so I was very happy when it showed up here! It's gotten good reviews by some reviewers I trust! Red by Allison Cherry: The premise seems a little weird but I'm intrigued based on chatter about this one! Let me know if you've read this one! Indigo by Gina Linko: I've never heard of this one but it seems to be paranormal and possibly a standalone? Anyone heard of this one? It is set in New Orleans which is a city I've been wanting more books to be set in! Splendor by Elana K. Arnold: This is the sequel to Sacred which I have on my shelf but haven't yet read! I'm really interested in it though! Loud Awake and Lost by Adele Griffin: I've been intrigued by this one for a while and I love a good mystery so I'm hoping this will be good!! I have another one of her books, Tighter, on my shelf..has anyone read that one? The Impossible Knife of Memory by Laurie Halse Anderson: One of my fave authors and I am SOOOO looking forward to this one! LHA has done so much for the YA scene and she writes some of the best books out there! The Book Thief by Markus Zusak: This was a reread for me for book club. Was very excited for this opportunity to share this book with the rest of the book club ladies as it is a favorite. PLUS, if you checked out my "In Memory of Lost Books" post, you'll know why I'm super excited. Have you guys read any of these?? Let me know what you thought so I can prioritize! Or let me know which ones you are planning to read/also own! So i've heard of most of these.. kinda.. But I haven't read any.. or umm.. even any by just one of those authors :( am I going to be shunned now?! HAPPY LATE BIRTHDAY! Enjoy your awesome new books! Are Just one Day and Just One Year good? If I Stay is my favourite book of all time but after Where She Went, I'm a bit wary of reading them! Also, Janet Evanovich is amazing, her books are all hilarious! After you read the one you have there you should really hop onto her Stephanie Plum series which are so great and particularly for getting out of a reading shlump because they are lighthearted fun reads! Hope you had a great birthday! So jealous over Just One Year! You had an awesome birthday!!! OMG JAMIE I'M SO JEALOUS THE NEW E.LOCKHART BOOK AND THE NEW LAURIE HALSE ANDERSON ?!?!? AHHHHHHHHHHHHHH! So lucky, can't wait to read both! I have read BEING SLOANE JACOBS and I suppose I am biased (know the author, name in acknowledgements) LOL! I LOVE that book. It's super fun. I always compare it to a Disney Channel movie - think the Parent Trap but for teens. I can't wait for the world to read it! It is super cool that you got to see Gayle Forman and that she signed your book! Eek! Check out my giveaway for Throne of Glass! The Rosie Project is so cute, I vote you start with it! I love this cover for The Rosie Project! I've been thinking about reading it for a while - it sounds intriguing. Hope you enjoy it! You will love The Book Thief. It's in my top ten of all time. The Mug Cakes book looks awesome, as well. Nora Roberts is a great place to start if you are just getting into romance. The Bridal Quartet is one of my favorites! You may also want to check out The Boonsboro Inn trilogy while you're at it. Enjoy all of those books!!! I still can't believe that Gayle Forman was in your neighbourhood and did all that birthday stuff -- how awesome was that? I've read Tighter and from what I can remember I enjoyed it. I'll probably go back and read it. You know that's not the first time an author has said this! I shall taunt you with your own book! It's beauuuutiful, btw! I want to read some book of Nora Roberts! !